A Japanese-backed effort to build a Dallas-Houston bullet train may just be the start of an international rail play in Texas as companies from other countries vie for a piece of potential rail projects in the state. Despite its car-is-king reputation, Texas has emerged as a hot market for international rail firms betting the state is ripe for a boom in high-speed rail projects. 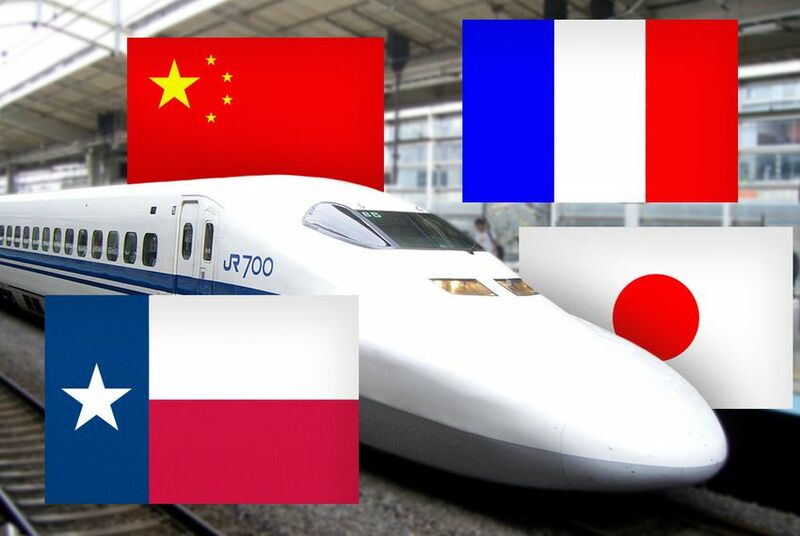 For more than three years, Texas Central Partners has drawn attention with its plans to develop a Dallas-Houston high-speed rail line using Japanese trains. While that project is furthest along, French and Chinese rail interests are more quietly discussing the prospects for rail projects with state and local officials. “There comes a time when adding lanes is not a solution anymore, and that’s when you realize you need more public transportation,” said Alain Leray, president of SNCF America, the U.S. subsidiary of French rail operator SNCF. The company has been talking with Texas officials in earnest for about a year about potential rail projects, Leray said. Chinese-backed rail interests have also approached some transportation officials in Texas about future projects, several transportation officials confirmed. Requests for comment through the Chinese consulate in Houston were not returned. Foreign rail firms have long viewed the United States as a potential market for expansion. About 25 years ago, several foreign-backed projects in Texas and other states drew strong interest only to fizzle out. More recently, some big projects have gained momentum. In September, a unit of Chinese train maker CRRC Corp. sealed a deal to help develop a high-speed train between Las Vegas and Los Angeles. This month, the U.S. government approved federal funds for a train between Washington D.C. and New York City using Central Japan Railway's magnetic levitation technology. If passenger rail projects take off in Texas, many international firms will be logical partners, said Michael Morris, transportation director for the North Central Texas Council of Governments. Morris has heard from foreign rail firms for years, but solicitations have picked up over the last 12 months, he said, as state and federal studies of the environmental impact of rail projects in Texas have moved forward. The Federal Railroad Administration is studying Texas Central’s proposed Houston-Dallas project and the Texas Department of Transportation is studying the prospects of passenger rail as far north as Oklahoma City and as far south as Monterrey. “Everyone in the world knows you can’t complete anything without an environmental clearance,” Morris said. Ross Milloy, executive director of the Lone Star Rail District, which is trying to build a passenger rail line between Austin and San Antonio, said he has also noticed increased interest from international rail firms over the last year and a half. “I think they view Texas as fertile ground,” Milloy said. Central Japan Railway (also known as J.R. Central) announced plans in 2012 to sell its Shinkansen trains to Texas Central Partners for the Dallas-Houston system. Texas Central has said it has no plans to take public funding to cover the system’s operating costs, though it has not ruled out federal loans designed to provide low-interest financing for large transportation projects. Two other international firms have since joined the project: a U.S. subsidiary of Spain-based Ferrovial is handling some engineering and pre-construction work, and British-based Virgin Rail Group is working on the customer experience at a passenger station, according to Texas Central. Yet Texas Central’s project has seen growing opposition over the last year in rural communities along the train’s expected route, with critics predicting the system will destroy quality of life and ultimately fail financially. Texas Central has said it hopes to see its trains begin operating in 2021. Just because multiple international firms are looking at Texas doesn’t mean they’ll all work together. Leray said he has talked to officials about the importance of developing a robust high-speed rail network in Texas, rather than just the Dallas-Houston segment. Among the concerns he raised in a Texas Tribune interview is that Texas Central’s line would be built specifically for Shinkansen trains and wouldn’t be able to accommodate other trains. SNCF operates rail systems in Europe that support trains by multiple manufacturers. In response, Keith pointed to the Shinsaken's safety record — no collisions or derailments in more than 50 years of operation. “By operating a single train technology, signaling and core operating system, Texas Central can leverage the history and record of the high-speed rail experience in Japan to ensure the safe, predictable operation of its trains,” Keith said. While business leaders and local officials may debate the expansion possibilities of a high-speed rail network that doesn’t yet exist, a more pressing issue is funding. During an onstage interview at the Texas Tribune Festival last month, Transportation Commission Chair Tryon Lewis said he did not see TxDOT playing a major role in passenger rail projects anytime soon. Beyond Texas Central Partners’ Dallas-Houston line, the project appearing to draw the most interest is a rail line between Dallas and Fort Worth. TxDOT created a special commission last year to look at the prospects for such a project. Bill Meadows, chairman of that commission, said the assumption is that such a project would develop with a private partner. “The state doesn't want to be in the high-speed rail business,” Meadows said. "There's enough private sector and regional interest that I see it moving forward in that fashion." The Dallas-Fort Worth line has outsized importance, Meadows argued, because it could someday connect a Dallas-Houston line with a train that travels along the state's crowded I-35 corridor to Austin and San Antonio. “It is the linchpin that ties the two corridors together,” Meadows said. In the next few months, Morris said he plans to work with a local or state entity to issue an official request for information for the Dallas-Fort Worth project to ensure local stakeholders hear from every vendor around the world who might be interested. Disclosure: Texas Central Railway is a corporate sponsor of The Texas Tribune. A complete list of Tribune donors and sponsors can be viewed here.